We have two offices that serve the D.C Metropolitan area located in Arlington and Reston. From North George Mason Dr., follow the signs to the ZONE A BLUE PARKING garage next to the main hospital entrance (1625). You will then take two sets of elevators: the garage elevators to the main lobby and the main elevators to the fourth floor. Please follow the signs to Suite 474. IMPORTANT NOTICE: the parking garage is managed by the hospital, thus we are unable to validate parking. The hospital charges $5 per day for parking. Please allow enough time to find parking to avoid being late to your appointment. VHC Campus/Parking Map – this includes Directions from around the DC Metropolitan Area. There is plenty of parking in the adjacent parking lot. Our office is located in the back of the building. 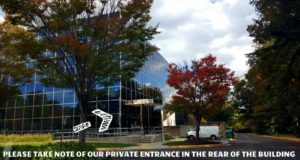 We are conveniently located off of the Dulles Toll Road, between Hunter Mill Rd and Wiehle Avenue Exits. It is located only minutes away from Tysons Corner and walking distance from the new Wiehle Ave. Metro Station.